A warm and funny story shared by grandfather and grandson, from new-comer Paul Newman and award-winning illustrator Tom Jellett. With glimpses of water safety and overcoming fears, this book is full of jokes and visual enjoyment for the whole family to read together, and perfect ... read full description below. 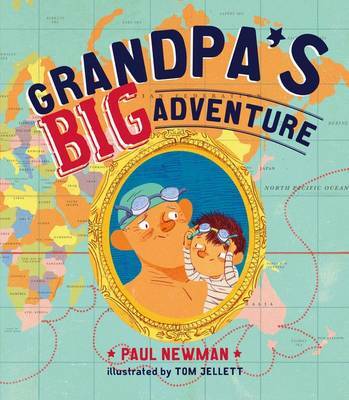 A warm and funny story shared by grandfather and grandson, from new-comer Paul Newman and award-winning illustrator Tom Jellett. With glimpses of water safety and overcoming fears, this book is full of jokes and visual enjoyment for the whole family to read together, and perfect for Father's Day. Paul Newman (Author) is an Irish-born author, illustrator and art teacher based in Sydney. He has worked in Dublin, London, Hong Kong and Sydney for a variety of clients in advertising, newspapers and magazines such as; Leo Burnett, The South China Morning Post and The Irish Independent. Most recently he has been an editorial illustrator for News Limited working on the Daily and Sunday Telegraph, The Australian and The Weekend Australian. He teaches observational drawing at Enmore Design Centre. He is the recipient of three Stanley awards for illustration. Grandpa's Big Adventure is his first book for children. Tom Jellett (Illustrator) is an Australian illustrator based in Sydney. Tom has been an editorial illustrator for News Limited, working on The Australian, The Weekend Australian and The Daily Telegraph and his work has appeared in the South China Morning Post, The Week and Medical Observer. He is an acclaimed children's book illustrator whose work includes a series about a little pirate (The Littlest Pirate), books about a teddy bear called Ted (Ted Goes Wild, Ted Gets Lost and Ted Hits Town) and most recently, the series Sporty Kids, written by Felice Arena. His picture book with Justine Clarke and Arthur Baysting, The Gobbledygook is Eating a Book, has been an Australian bestseller whilst his latest picture books with Penguin Random House include Why I Love Footy, written by Michael Wagner and Grandpa's Big Adventure written by Paul Newman. In 2011, Tom was included in the editorial category for Illustrators 53, exhibited at the Society of Illustrators, New York.